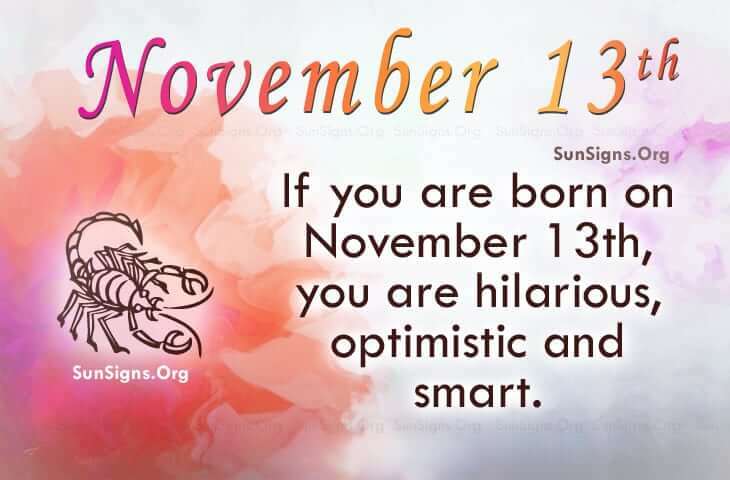 Famous people born on NOVEMBER 13 Scorpio are the source of laughter for a lot of people. Among other things, they are hilarious, optimistic and smart. They tend to take other people’s feelings into consideration but they don’t let that stop them from getting the job done. They have a knack for delegating the right job to the right people and this makes them special. When it comes to their profession, they may have a few before they come to the right one. This is okay… they won’t be the first or only one. Having friends from different backgrounds seems to make life interesting for famous November 13 celebrities but making friends has been difficult for them. It’s real easy for their feelings to get hurt though. They tend not to let them know this as they want respect from others. However, they could become intolerant of those same people leaving them to wonder ‘What is wrong with you’. They should talk it over so they don’t infect people with their bad attitude. Famous people born on NOVEMBER 13th are a parent who is sympathetic but not naïve. They are caring and perhaps, they worry about things they should not. They need to find the root of their trust issues and they will feel better.